We are now flying solo – sailing without the assistance of family or our friend and skipper, Mark Burton. I don’t take this experience for granted. It is nothing short of exhilarating each time we anchor out, motor from point A to point B, or put up the sails. My daughter Betty marvels at my fist-pumping enthusiasm – as she is not used to seeing this level of excitement from me. Meanwhile, my husband, Rick, has taken to homeschooling in a big way. We haven’t yet worked out a schedule yet. The fact that it’s a weekend is no impediment. Our kids are keen to learn. So school starts now. Nine-year old Betty is learning about navigation. 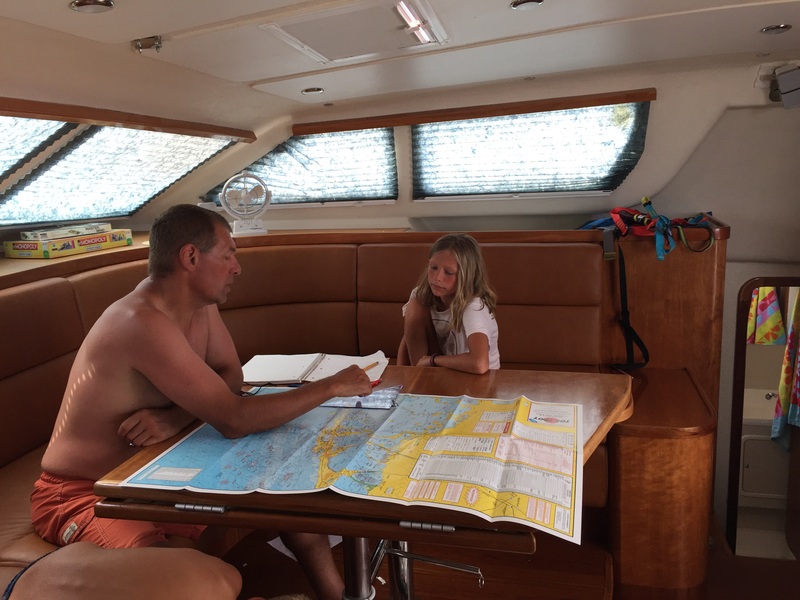 Rick and Betty discuss an RYA chart. 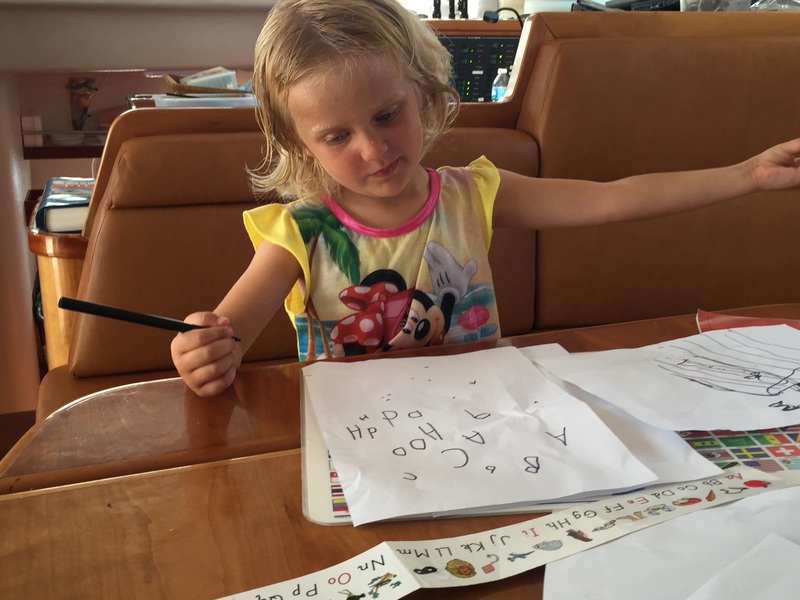 And, four-year old Karen has taken to printing her first letters with amazing precision. Karen learning to print the alphabet. I have learned to use our gas-oven and made our first loaves of bread. First loaf aboard SV Aphrodite. Dense but delicious. 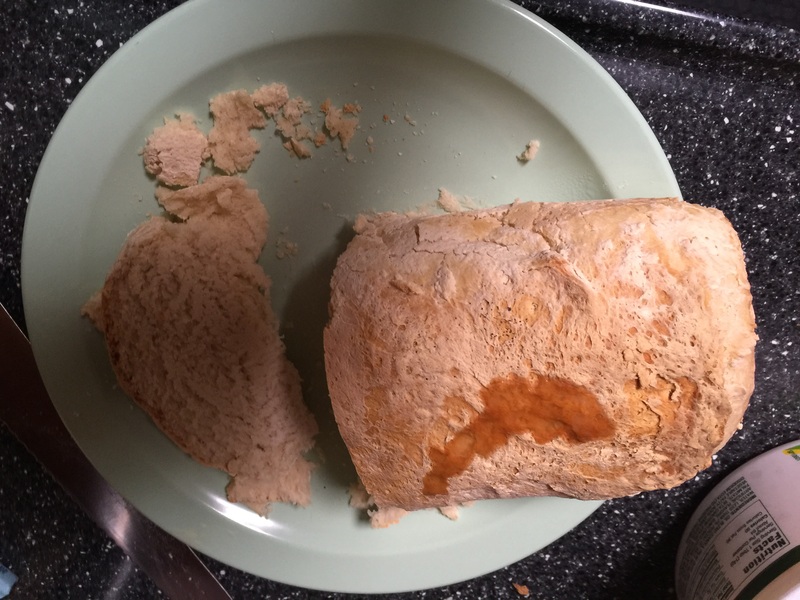 The bread was good but I need to work on my timing. Baking, during the day, on a holiday weekend in Tampa Bay? Pfft. There’s sailing to do. A holiday weekend in Tampa Bay is not exactly peaceful. All manner of water vessels mill and anchor about around us. Jet skiers constantly buzz and circle our boat. One young man circled is so close to us yesterday that his spray went into Paul’s bedroom window. On our VHF radio the coastguard issues warnings about approaching storms. On Twitter someone posted a picture of a waterspout, seen in our area. But it is all part of the excitement out on the water. The most peaceful time of day is at sunset. The dishes are done. We’re all nicely fed. And, our family is six sits outside together on the trampolines. Tonight we saw some fireworks, Paul saw a fish jump, and Betty sang to us quietly. Your blog is a delight to read, you have a gift. you all look like you are thriving. Evelyn gasps every time you mention a dolphin. She is mightily impressed with Betty’s classroom. First day of school here tomorrow.